Many thanks to Andy Black for the transcription. #1Hi Alan, thanks for the time you spend for us. We are from the Italian Supporters Club and you're one of the most respected and idolized player. Everybody love the way you play. You're pure class and the number 10 fits perfectly. About this, we'd like to know why you and Bishop swapped your numbers and what does it mean for you. Why did we change numbers, because we were told to by certain people in the club. Obviously I did have the Irish Messi and he wears the number 10. I would rather have kept number 14 but I think Bish was happy that he got the number 4. He has scored twice as many goals as he's ever scored with his club, so maybe he should have the number 10. #2Now Notts is on the 7th place of the table, just 5 points from the top. What is the team objective this season? Both in League One and in the FA Cup. Definitly the league at least the playoffs, that's I think our main aim. Anyone that is looking less than that shouldn't be part of the team. Which is what the manager has said, playoffs at least. We are only 5 points off 1st so anything can happen. So we will just have to keep working hard and hopefully we will get it. The FA Cup, you would like a good run. Rotherham aren't a easy team to beat as we seen when we played them at their new stadium. So it will be a tough game come Tuesday, but we will try to go as far as we can. Obviously we get Aldershot in the next round, so it's a way to go far in the cup. We could get to the 4th round and that's no disrespect to Aldershot if we get there. It will always be a tough tie so it will be interesting. #3What are your personal objectives in this season? How many goals and assists? Is there also the desire to play for your National team? To hit double figures, my goal that's my main one. Because I'm doing ok in my assists, in fact I'm doing better than last season in everything. So my stats are looking good this season. So I'm on the way to get at least 10 goals this year. Of course who wouldn't want to play for the national team, but honestly I don't think I will be the sort of player to attract Trapattoni he wants. I think we are too far down the league, but hopefully if we get promoted with Notts it will come next year. We will wait and see what happens. #4Who was your favorite player when you were young? Who is the player from which you have learnt the most? Paul Scholes, with out a doubt he's just, everything he does. I've even learnt how to tackle like him, hence that's why I'm suspended for tomorrow. So he's just brilliant everything on the ball. Composure, best player I've ever watched. #5People call you 'Irish Messi', what do you feel about that? How many 'Irish Messi' shirts have you bought? I was a bit embarrassed when it first came out because I was no where near him, but it's just a bit of banter that's all it was. When my family heard about it they wanted to buy about 20 shirts, so i think they ordered a box from the club. I stopped that from going over. I was a bit embarrassed to see people wearing that t shirt. I shouldn't even be mentioned in the same sentence as him, it's a joke. Obviously it's flattering I will take that but it's a bit weird being called the Irish Messi. #6Do you know that Notts County has supporters all over the world? 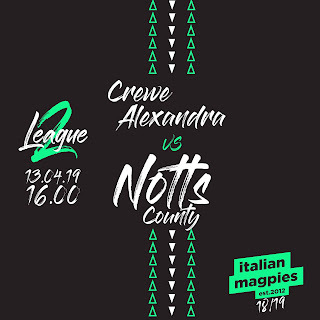 As Italian Magpies we've been in Nottingham twice and we'd like to be there soon. What do you think about that? It's Brilliant , I think it's great. The whole Juventus liked the Notts County kit, we gave them the Black and White. When we went over there the experience was just unbelievable, they were so friendly. Brilliant. The stadium was unbelievable, just the thought of playing in there new stadium. We was one of the first people to play in it, it's crazy. Obviously to play them in a return leg would be unbelievable for the club to play that sort of game. All the lads wish for it to happen. Many thanks to Alan Judge, Andy Black and Dane Vincent.